September was a terrible time for a majority of Facebook users last year and the social media ultimately received a FAIL from many a Facebook aficionado in the design department. What with the backlash that ensued as a result of forcing its users to a new layout, you would have thought Facebook would have at least let the dust settle and the cooling off process to come to an end before Zuckerberg and his team of merry men decided to give it another design overhaul… right? Wrong. 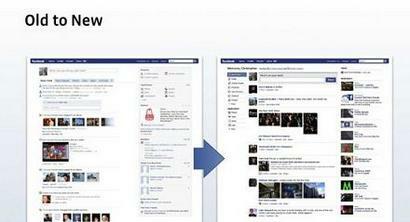 This time, it’s the Facebook homepage that’s been detained and subjected to a design revamp. The design overhaul means it’s a case of goodbye News feed, hello news Stream. The brand spanking new design will move into live territory today and hopefully provide users with a more efficient and tailored FB experience by feeding the news stream by friend type, network and group allegiance, giving users a much easier (they hope) way to put up links, photos and videos and a way to filter out updates from your more irrelevant FB friends. This new-fangled homepage will also update in real time without the need to relentlessly refresh the page – which is great news for compulsive FB stalkers. And instead of being asked ‘what you’re doing at the moment?’, you will now be presented with a more profound question, that runs the risk of making you feel you’re sprawled on a psychiatrists couch by asking ‘what’s on your mind?’. The page is fully customisable, so if you want to view updates from one batch of friends and not another, this is totally doable. Let the backlash (or not) commence. Apple to release netbook after all?